In 1970 the second piece of literature focused on bodysurfing was published. 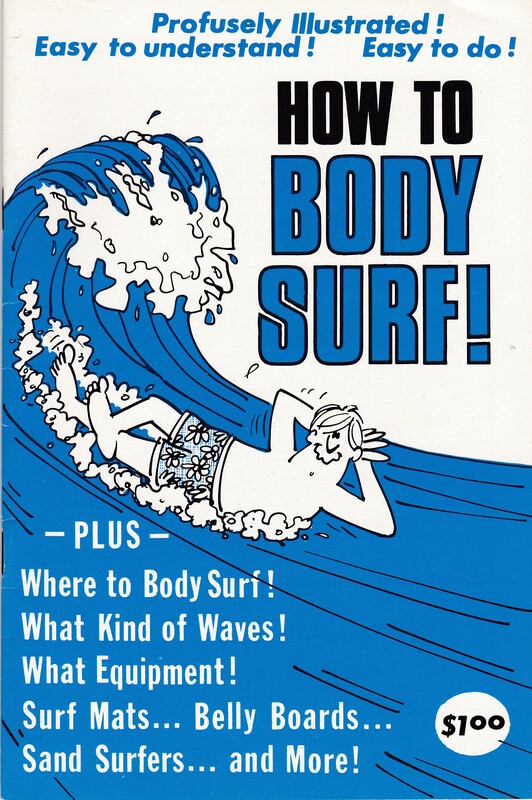 In contrast to the first publication 39 years prior, How to Body Surf is an illustrated pamphlet by a prolific artist and novice bodysurfer. The pamphlet was not widely popular at the time and Dewey himself doesn’t have a copy of it, but the artwork and commentary are unique and creative among bodysurfing’s early culture. Nelson Dewey has a long career of producing surf art and our sub-culture finds a hidden gem in his early effort to re-introduce the world to bodysurfing. The nineteen page pamphlet starts with beginner information like where to bodysurf and who can bodysurf. In the almost fifty years since publication, there are many bodysurfers who would disagree that “…a hollow, tubular type (wave)… isn’t a good wave…” for bodysurfing. There are a few such claims throughout this publication where the athletic progression of bodysurfing is clear, but the visualizations of bodysurfing for beginners stand the test of time. As shown above, Dewey provides interesting and technically-sound illustrations. The top, demonstrating how to predict sets and the bottom showing the proper technique for diving under surf. It is a delightful experience to see an artist’s vision of the bodysurfing experience. I’ve often wished for the skill to communicate the technical aspects of our sport which become so cumbersome in word form. I particularly enjoyed Dewey’s visual of the most common experience to all bodysurfers, the wipeout (above left). In the age of digital resource Nelson Dewey’s “How to Body Surf” holds up as a creative and light-hearted journey into the world of bodysurfers. Given the absolute rarity of this work, it could easily be very valuable to the right collector. It should be noted that no previous sale of this pamphlet could be found, so an exact price is anyone’s guess. Should you stumble across a copy, I think you would find joy in the sandy pages. Special thanks to Nelson Dewey for providing additional information on his production of the pamphlet. You can check out more of his work here.